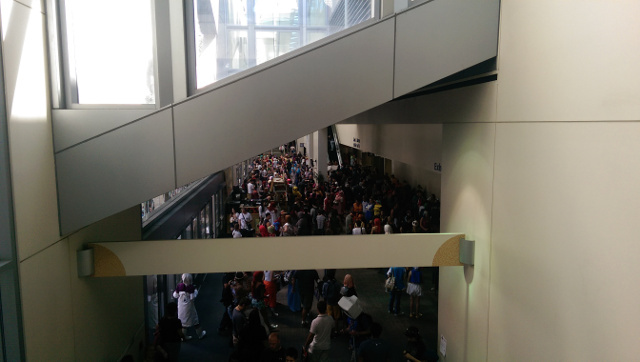 Feeling Less Interested in Attending Conventions As Time Passes – Nigorimasen! As anime/manga convention season heats up with AnimeNEXT happening this weekend in New Jersey and Anime Expo & Otakon around the corner in July, I’m seeing many people I follow on Twitter either at these events or preparing to attend one. That got me thinking about my previous convention experiences and my plans for going to any in the future. The last two conventions I actually attended were relatively small compared to larger ones like AX and Otakon: AOD in late January and Kraken Con in April. Both happened in the San Francisco/Oakland region of Northern California and I only attended them on a single day basis. Some key reasons why I traveled to those two events were: 1) I knew someone who was presenting panels there and 2) I wanted to explore their venues. Hanging out with people I know, particularly those whom I’m meeting for the first time in person after conversing with them online for a while, is a big draw for me to attend certain cons but there also has to be enough for us to see and do there to make it worth going for me. What got me to start writing this post was thinking on-and-off about the range of convention panels being held nowadays. It feels like there are at least four categories of panels at these events: promotional, informational, entertainment, and guest-focused. Each type has their own place and they’re not mutually exclusive categories. In recent years, I have tended to seek out more informational and guest-related presentations because they sometimes offer perspectives and topics I don’t often read or hear about – one example being “When the Walls Start Closing In: Hikikomori and Ijime” late Saturday night at Otakon 2011. I can simply read about most announcements and news from promotional panels after the fact (or as they happen, if someone is tweeting from the audience), meaning I don’t necessarily need to sit in on those, and the entertainment ones have started to feel frivolous to me. My current sentiment about entertainment panels doesn’t mean I haven’t enjoyed some in the past. Banzai Arcade, a game show involving contestants advancing through custom video game dungeons as they answer trivia questions, was a fun one I saw in a packed hall at Fanime some years back. It’s more that my tastes have shifted as I’ve reached my late 20s and things like in-character “ask” panels seem like something targeted at a younger audience than the one I’m currently in. A secondary reason I’ve attended some conventions in recent years was to present panels. I did ones about sports anime/manga in 2012 and 2014, mainly because there were few similar panels being presented and I felt like I was filling a perceived void. There have been numerous panels at various conventions on that subject alongside the boom in popular sports series like Free!, Haikyuu!, and Kuroko no Basuke. I’m happy about that development, especially when I hear about panels covering earlier series. However, because of the subject’s current popularity, I feel I should focus on a different topic if I were to present a panel at a future convention. I have a couple ideas that aren’t well developed at the moment so any potential panel from me would happen next year at the earliest. Even if I never present another panel, I would like to attend some conventions or fan events in the future, such as Otakon Vegas or Kumoricon in Vancouver, Washington. I’m hoping my general mood about conventions changes in the coming months and also hoping there’s an increase in interesting things happening at those events to convince to go to them. Tagged conventions, fan events, panels. I think what happens later as one gets to be an older anime and manga fan is that we want to get more serious with the anime and manga we consume and that is why Entertainment panels or anything only surrounding the fans would become frivolous. That is why if I ever attended a convention the two areas I would most be interested in would be promotional and informational related panels.